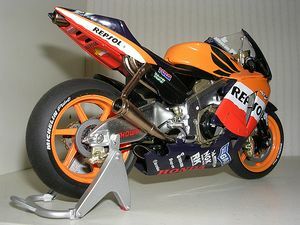 The Honda RC211V was developed in 2001 by HRC (Honda Racing Corporation) because regulations for the World Championship motorcycle road racing 500 cc class were changed drastically for the 2002 season. The regulations changed, 2-stroke engines were -as before- limited to 500 cc and 4 cylinders, but 4 stroke engines were allowed to grow up to 990 cc and an unlimited number of cylinders. The name of the class was modified to MotoGP, and is limited to race prototypes only. In the beginning the RC211V was a unique machine, featuring a V-5 engine. Honda claims more than 240 hp (179 kW), 145 kg, and 330 km/h top speed. After dominating the races with rider Valentino Rossi in the debut year 2002, the RC211V/Valentino Rossi combination was a winner too in 2003. Nicky Hayden on the Repsol Honda RC211V is the current 2006 points leader in the MotoGP series. 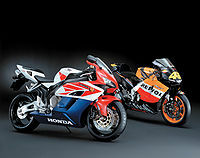 The Honda RC211V greatly inspired the design of Honda's CBR1000RR. This page was last edited on 8 September 2010, at 12:10.